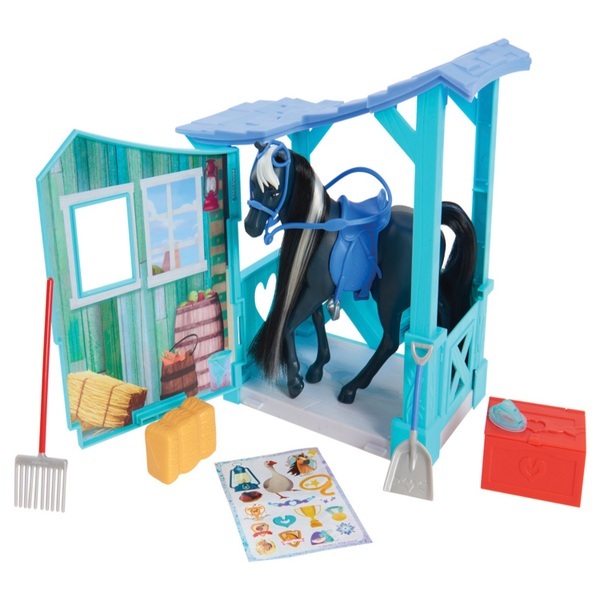 Kids can care for and nurture their horses with the Spirit Classic Horse & Stable and included accessories! The stable side wall opens to create a large play area! Stable has a handle to take on the go! Horse has beautiful, rooted hair for brushing and styling! Now fans of DreamWorks Animation series, Spirit Riding Free can take the experience on the go with the new Spirit Riding Free Collector Series Stable and Horse Accessory Set. The set comes with a 7"" horse inspired by the show, stable, hay, shovel, rake, saddle, bridle, brush, tack box, and sticker sheet. The stable side wall opens to create a large play area. The horse comes with beautiful, rooted hair that is perfect for brushing and styling. Kids can take care of their horse by grooming him with the brush and keeping his stall clean with the all the tack. When they are done nurturing, and caring for their horse friend, they can place him inside the stable, close it and use the handle to take the stable on the go! The horse and stable are the perfect size to pair with the Spirit Riding Free Spirit Barn Playset (sold separately) and Spirit Small Doll and Horse Sets (sold separately).